Winnipeg Jets players and hockey legends came together this weekend for the Heritage Classic Hockey games being hosted at the Investor’s group field. 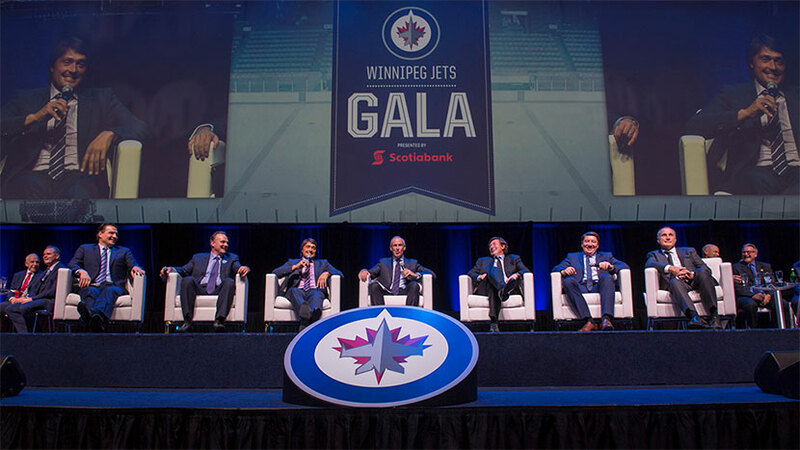 To kick off the weekend, the True North Youth Foundation put on the 4th annual Winnipeg Jets Gala Dinner presented by Scotiabank which took place at the RBC Convention Centre on Friday, October 21, 2016. This year, Ron MacLean hosted the gala, and over 2,000 attendees had the opportunity to experience a four-course meal while listening to the address of chairman, Mark Chipman. This unique event tied together both public and private corporations, bringing forth the opportunity to socialize with the both current players and alumni, as well as support Manitoba Youth. This year, the gala dinner was able to raise over $685,000 (net); being able to touch the lives of underprivileged children across the province. This dinner not only raised funds, but also brought to attention the amazing work that Camp Manitou, Project 11, and the Winnipeg Jets Hockey Academy are doing in our community. Complete with a silent auction and live music performed by the Big City All Star Band, this year’s gala featured a Hot Stove hosted by Ron Maclean and included Winnipeg Jets greats Dale Hawerchuk, Teemu Selanne and as well as Oilers legends Wayne Gretzky and Mark Messier who traded stories and reminisced about some key hockey moments. This event is one of a kind, and provided the ultimate Winnipeg Jets experience to all who attended.